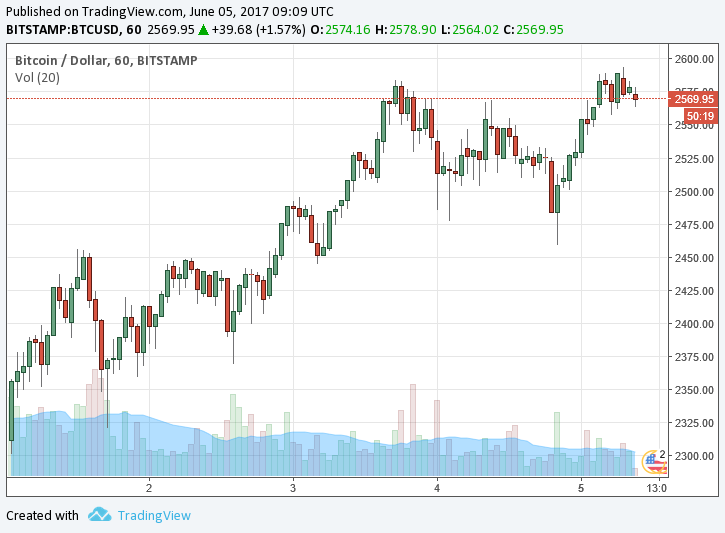 After a substantial correction last week into the sub $1,900 range (from an all-time Bitstamp high of $2,760.10), Bitcoin has been holding a stable uptrend. Aside from two minor pullbacks to $2,080.25 and $2,152.97 respectively, it would seem that it is poised to break out above $2,600 which is also a level to watch, considering how close it is to the previous local high. If the local high is broken ($2,599.38), then it is likely that a move above the all-time-high will start another bull run, quite possibly even up to a $3,000–$4,000 range. There are many factors that could further facilitate such a turn of events, one of which is the resuming of BTC withdrawals on three large Chinese domestic exchanges, OKCoin, Huobi, and BTCChina after an almost 3 month regulatory freeze. Bitcoin adoption is growing at a steady pace across the globe; however, the main driving force behind the current price gains seems to be originating from Japanese, South Korean, and other Asian consumers and traders. Caution should be exercised though; the current rift between Bitcoin Core developers (Segregated Witness) and supporters of the Bitcoin Unlimited (Emergent Consensus) is still present. It has already resulted in a definitive split within the Bitcoin community. Confusion and uncertainty from the current stalemate could also serve as catalyst for a larger future downward price correction.